So being a niche blogger does have its perks. Like being offered to review premium services free of charge. Not only, do I have an interest in language learning, but I’m very interested in how hypermedia and new media can be used to aid the language learning process. That’s basically what I’m aiming to study next year as well: an MPhil in Hypermedia for Language Learning. L-Lingo is one of those sites that utilize various media within a web context. 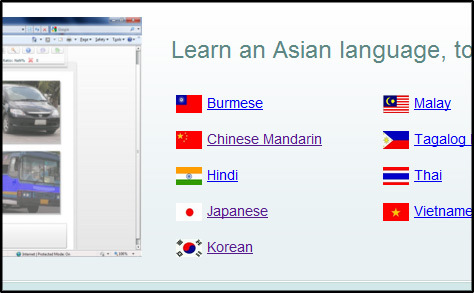 The site fills a great niche, which is definitely up my alley, by providing learning for Asian languages. 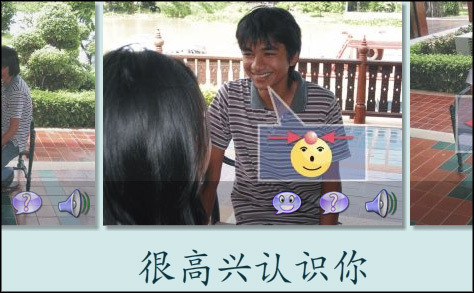 From Chinese to Thai. It’s homepage looks great and draws you in. Some minor grievances: not being able to login from the homepage and clicking on a language brings you to another page and not straight to content. L-Lingo uses a nice in your browser interface to bring you the content. It is also presented in 4 languages. Upon entering the content you are greeted with a pop-up, letting you pick your settings, such as phonetic script or standard script and then providing you with tutorials. Although the tutorials are useful, I feel that a program should be created in such a way that it can be used without even using tutorials. It should be obvious from the get go. That is where L-Lingo fails a bit. Maybe, I’m not “getting” everything as obvious, but there are big questions, but it just doesn’t explain enough of why things happen the way they do, and what goes on. 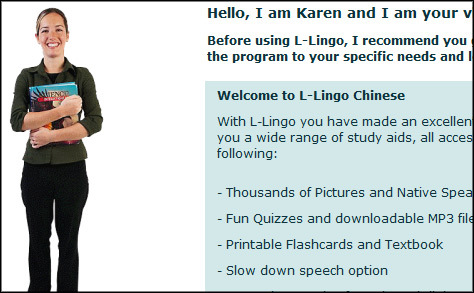 If I click on the first lesson and enter the “training mode” I am bombarded with pictures and sound and text. It is overwhelming. Furthermore, when it ends there is no clear indication on what is happening next. Should you do something? I don’t understand. I’m clicking things, but it’s just not clear. Even then, when going to the “next section” is still doesn’t tell you what is going on. Thus, L-Lingo suffers a bit in the user interface department. L-Lingo’s content is presented in an interesting manner. They use pictures and sound in all posts and the quality is good. They also use, as shown above, interesting diagrams to support the picture itself to aid understanding. This once again, interesting in its own way, lacks proper explanation. Later I felt that I’m learning how respond to those symbols and not the pictures themselves. L-Lingo, however, cover a wide range of functional helpful content, from getting numbers right to tasks such as “At the Airport” and so on. Thus, the content they provide are relevant, which is a big plus. However, their content is not presented in an entirely satisfactory way. They aim more on learning phrases as a whole, than separate words and functions of linguistics units. I’m an intermediate Mandarin speaker, thus the first lessons were obvious for me, however I thought how would a new learner of the language learn this? So I quickly tried some other languages such as Japanese and Korean, which I have very little knowledge of. Yes, I could complete the quizzes, but I had no idea what I was learning other than just the rote repetition of whole phrases. Also for an intermediate learner of Mandarin, the starting content was boring and there was no indication on the difficulty, so I could skip to my level. However, the gradient it took was a nice gradual increase in complexity. This being said, the learning process just isn’t completely captivating. After trying the Japanese, I felt the same kind of lack of motivation to work through the content. This, could possibly be because of the lack of guidance, but I felt that the process, although presented in a nice way (pictures + sound), was still slow and slightly boring. An interesting addition is the ability to print and download the content which explains the content a bit better, but it’s not entirely there yet. L-Lingo has an interesting approach and one that uses multimedia really well. However, there are some things that are lacking in its approach. Maybe I’m just really impatient, but I felt frustrated by the program and its deliverance of the content. It seems like a new website, thus if can remedy the way it guides the user and add some more concrete explanations to the content, then L-Lingo could be great, especially as a need for Asian languages. +/- Quizzes feel rewarding, but at the same time I’m not even sure if I know what I am learning. Just that I could connect one sound byte to a picture. L-Lingo is letting me give away 5 Premium Licences to their website that lasts for 3 Months. You can choose any language of the 9. The first 5 people to either email me ([email protected]) or comment below will get the service. EDIT: 1 spot still left. Also just waiting for L-Lingo to get back to me, then I’ll send you guys the details!